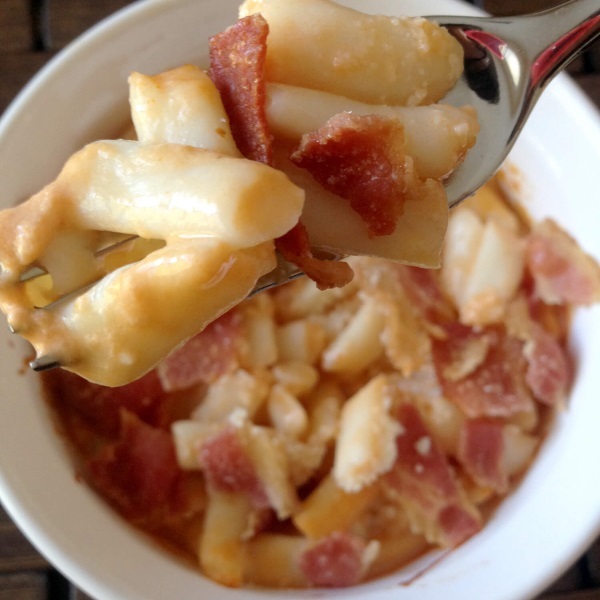 Healthy bacon mac and cheese?! Don’t pinch yourself, I assure you this is real life! There are a variety of ways to make this recipe, so feel free to change it up according to your liking and macros. For instance, you can change the type of cheese, depending on if your macros allow for higher fat. The bacon and cheese I am including in this recipe are the lowest fat, lowest carb that you can buy in common grocery stores. Rinse shirataki noodles thoroughly and strain. Spray pan with pam and cook noodles over medium-high heat for 2-3 minutes. In another microwave-safe bowl, add laughing cow cheese and fat free American cheese. Microwave at 30-second intervals for 2 to 2.5 minutes until cheese is uniform in melted consistency. Cook bacon on stovetop or in microwave (whatever you prefer) until it reaches desired crispiness. Add cooked shirataki noodles, salt, paprika, and 7g coconut flour to melted cheese mixture and stir. Pour mixture into a small oven-safe dish/bowl and bake in oven for 8-10 minutes. Take dish out of oven and break apart bacon into little pieces and sprinkle on top. Set back in oven for 1-2 more minutes. Note: This recipe can vary significantly and it will be yummier as fat content increases. Feel free to add more bacon and cheese of higher fat content, and even cream cheese (for extra creaminess) if your macros allow. For the purpose of keeping this recipe as low fat/carb and high protein, I included the lowest fat/carb ingredients as possible.